My friends down at Evolution Studios produced this magnet for me. (Thanks, Jay!) You kinda have to see it to believe it - it's almost letter-sized! Eeeeep! After this magnet, I promise to stop talking about all this silliness. I've mentioned a few times that while down in Tampa, I ended up with the assignment of working with Erik Estrada as he issued Sight-ations at the Transitions Championship. I don't mind saying that I was filled with all sorts of trepidation and doubt about how this stunt was going to fly. I was pretty vocal about it, too. But, I also don't mind admitting that I was wrong to be worried - turns out Erik was a really big hit with the tournament attendees and the media. As was expected, Erik was a great hit with the chicks. But, it wasn't just the women who were anxious to meet him (seriously, a couple of those women pushed and/or nudged me out of the way - we had to have one of our own guys be our muscle!). But the guys! The guys! We'd be whizzing by in the little golf cart, and you'd hear, Ponnnnnnnch! from more than just a few boys. In fact, they were angling for pictures almost as much as the women were. I know. I have proof. And every law enforcement guy within 20 yards wanted their pictures with him as well. Very sweet, with several of them telling Erik that it was because of CHiPs that they became cops. Dudes, at some point, we were practically surrounded by boys in uniforms. Ya'll know I loved that. 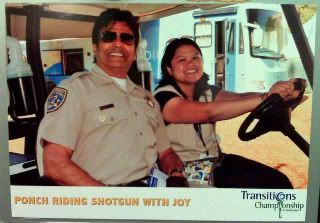 Yep, I'll admit doing a ridealong with Ponch in a golf cart was almost as good as if we'd been on motorcycles riding down the PCH. *I've never really been one to mix characters with the actors. Erik is Erik. Ponch is Ponch. But, it was hard not calling him Ponch like everyone else, given that he was in uniform about 80% of the time we were running around Innisbrook. I won't lie, for the first day, I was pretty much calling him Dude (as I'm wont to do), or hon, because it felt weird to call the guy by his first name. Oh! One other thing. I've done Starmeter jumps from imdb.com before, for Matt Smith and David Tennant, from Doctor Who. But, I just took a gander at Erik's numbers. That's a fairly decent jump in a week, methinks. Maybe next year he can give out DW-eyes! ok, I'll stop. Hahahaha - good one TonyP. You should get together with His Royal Punniness, Rob. And, GG, I wouldn't put it past Erik at all. He's super popular, but I think he's just been doing his own thing - being a real cop in Indiana, and a sheriff in Virginia.